Saturday, January 23, 2009 at about midnight, Glen Kruger took a bad fall down the cellar stairs breaking his arm and fracturing his first vertebra. Unable to move he desperately tried to yell and awaken his sleeping family. 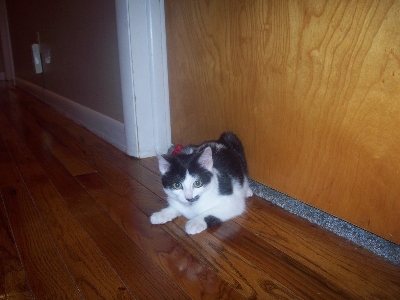 His calls for help were soon answered by the face of Inky, our SPCA rescued cat, in the doorway. Desperate for any help, Glen told Inky to go get Brenda and to the surprise of all she did. Awakened by the sound of yowling and scratching at her door Brenda thinking the cat wanted to go out, went to let the her outside and saw her husband laying at the bottom of the cellar stairs. Our beloved Inky who at one time no one wanted came to the rescue! Our hero cat! Thank you SPCA. Linda Botens, the Dog Control Officer in the Cuba area received a report on an injured dog that had come up on the caller's porch. Because of the suspected injury, Linda called us for assistance in picking him up. When we arrived we found a very skinny, weak but friendly black and tan male German Shepherd, it was clear he was not injured but in need of some help. We loaded him up and off to the shelter he went. Once at the shelter we were able to closer exam him, he has extremely enlarge testes, his gums were pale, his coat in need of help and his nails were extremely long. He was also infested with fleas, so it was off to the bath to combat the flea problem. As the days went on he gained weight, was always happy to see the staff, loved his treats, He was a spoiled boy! Then came time to get Odie neutered, we found out he has cancer of the testes and the vet also told us he was 8 plus years, had arthritis and dental problems. Well we had come this far so we were going further. We went ahead with the surgery, did chemo and Odie did very well. This guy was a fighter! Once he was cleared he was put up for adoption, but we were worried, who would adopt this 8 plus year old dog with so many problems! Well on 2/15/09 a very kind lady came to our shelter and she wanted Odie. He was so excited to be going home. 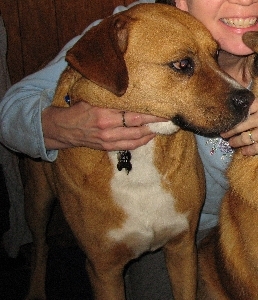 We want to thank Nellie Miller for adopting a dog who no one wanted. She saw in him, what we, here at the shelter, saw in him. 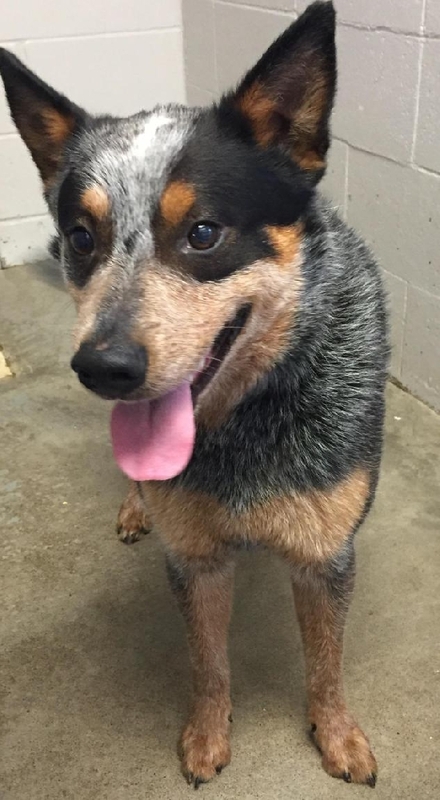 A great dog, very friendly, lovable and just wanting someone to call his own. When we received Rudy at the shelter he was severely matted, full of dirt and feces and had to be bathed 5 times before we could get him cleaned and he also had an injured leg. 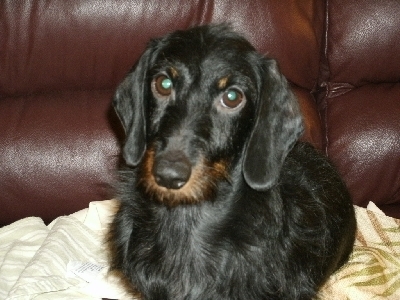 Fortunately, the new owner offered to adopt him as is and got him the help he needed. They also are happy to keep us updated on how he is fitting in with their family. Looks pretty cozy doesn't he? Here's what his new owner has to say about him: In January I adopted the adorable apricot poodle named Rudy. Rudy was in pretty rough shape but he is doing wonderful now. He had a previously broken leg that had not been treated. Unfortunately, soon after we adopted him, he broke his other front leg (the vet said that he was overcompensating with that leg because of the other injured one). As a result, Rudy had casts on both front legs for approximately 6 weeks. He is now doing wonderful. He runs through the yard and plays with our other dogs and cats. In addition, he has gained some weight (he's up to 7 pounds now) and has seen the groomer a few times. We feel very lucky to have him! GABBY ...IS GABBY WAITING FOR YOU? 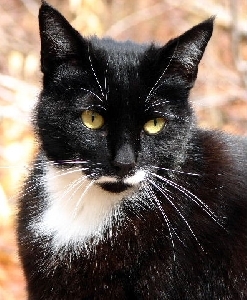 The SPCA received a call last January when the temperatures were in the single digits about a stray cat in Andover. When SPCA employees arrived, they found Gabby huddled underneath a parked car. Her ears and nose showed obvious signs of frostbite. She was brought to the shelter where she could warm up, have something to eat and receive veterinary care. After a few days, Gabby went to college, as part of our partnership with the Alfred State College Vet-Tech Program, under the supervision of Dr. Melvin Chambliss. She has since graduated from Alfred, looking and feeling fine. Gabby is waiting for her forever home at the SPCA Serving Allegany County. 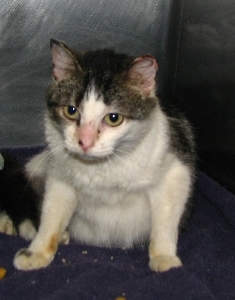 You can see Gabby and her feline friends on our Adopt a Pet section. 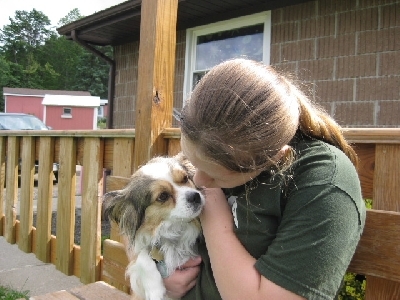 Deanna was a sweet but shy Tibetan Spaniel who was turned in by her owners as they were being deployed overseas. Deanna was an unusual case, as she would take quite awhile to warm up to any of us at the shelter and was rather difficult at times. 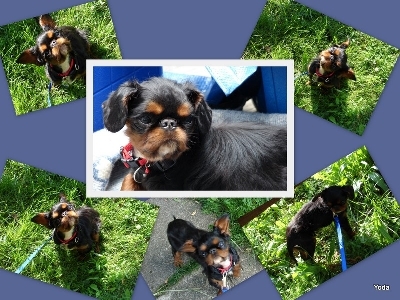 What were we to do with this beautiful little dog that had difficulty with people? Emily Starr our vet tech, took the time to sit with her each day and finally won her over. One day a fine older gentleman came in and wanted this little shy and trying dog we called Deanna. Off she went to her new home and she gave her new owner quite a hard time, as she would run away on him and hide and many times would not let him near her. Finally Deanna let her new owner into her life, and she soon became one spoiled dog! One day her owner stopped by the shelter to ask us to board her while he went to the hospital for some tests, unfortunately he was told he had lung cancer and had not long to live. He took his girl Deanna home for another month and then came back to drop her off for the final time. He asked with tears in his eyes for us to find her another loving home, Deanna was very depressed, she didn't understand why she was back here and not with her owner. She just wanted to curl up and give up and we couldn't have that, again Emily made sure each day time was spent with Deanna. Then one day a lady came in and met this beautiful tan & white, long flowing haired dog. She fell in love with her and adopted her. We want to thank Kathy Madden for taking a chance and opening her heart on a scared, lonely little dog who thought the world of her previous owner Jerry and missed him terribly. Thank you Kathy for making his dying wish come true! HARLEM ...Finally Finds a home! One of our longest residents at the SPCA was Harlem, he was with us for 3 years, most people over looked him at the shelter since he was a bit older and not a puppy. But we all knew at the shelter what a special and well mannered boy Harlem was, and this spring he did get adopted, but his new family fell on hard times recently and lost their home and they were unable to keep him any longer. They returned him to the shelter and Harlem was truly confused as to what happened and why was he back here again. Our hearts went out to him, none of us wanted to see him spend another Thanksgiving or Christmas at the shelter, he deserved to be in a loving home. Kent Johnson heard a soft meowing sound as he was home working in his garage, not sure where this faint noise was coming from, he then found a very small black and white kitten behind their heater in the garage that appeared to be dead, eyes glazed over and lifeless. He called his wife to tell her what had happened he then went to pick this poor little gal up and much to his surprise she meowed, she was somehow still alive. Not knowing what to do he put her in a small box with a blanket to warm her and he tried to give her a few drops of milk that just rolled out of her mouth. The SPCA was contacted and this little kitten was brought up to the shelter. Our vet tech Emily Starr, immediately went to work to help this dying kitten, she could not even pick up her head, just a faint meow from time to time and her eyes were still glazed over with an empty stare. She was dying from starvation and the cold. They kept her warm with a heating pad and just went hour by hour, at the end of the day they were finally making a little progress and seeing a small hope of life. By the next morning she could lift her head, each day proved to be a challenge, but this little kitten wanted to live! Lucky has been adopted by the same people who found her at death's door that cold morning. Thank you Sheri & Kent Johnson. Connie our shelter manager received a call from Dog Control Officer Kathy Faulkner that she had picked up an extremely skinny and very old dog that could not walk. She truly thought the dog was going to die, we asked her to bring him to the shelter so we could get him some medical attention. When he arrived he could hardly raise his head, we took him in and set him up in a nice comfortable bed, gave him some water and started him on a rice and chicken broth diet. It took 4 days before he finally had the strength to get up to go to his water bowl. He gained some weight each week, and as time went on we found Old Man had a very funny and playful personality and he just loved the lady dogs!! When his dish was empty he would pick it up and carry it around so we knew he was ready for more food. We were all thrilled with his progress, but then the vet told us he was extremely old, blind and possibly deaf and we wondered who would step forward and give this poor Old Man a chance to live his remaining time in loving home. Andrea Brockel came forward and took him home with her other SPCA shelter dog, she and her family showed him the love and attention he so desperately needed. Andrea said: "He had quite a bit of spring left in his step and was such a good boy. He was acting the same way the day he died, that's why it was such a shock to us that he was dying that night. It was like he was fine and full of life one minute, and we snapped our fingers and he was dying. It broke our hearts to see him go. We really grew to love him in such a short time and even though it was not nearly long enough, I'm so glad we were able to show him what a real home is like and how people are supposed to treat their pets." Thanks for the privilege of knowing Old Man and for allowing us to bring some happiness into his life. We miss him so much! DUKE ...Getting Duke back on his Feet! Duke was brought to the shelter by the Belfast Dog Control officer with a severely broken leg. This sweet young man never cried out in pain when he was checked out by the vet, we could tell he was grateful and loved the care and attention he was getting. Now the race was on to find extra funding to get his leg repaired, e-mails went out and our community stepped up to help pay for this poor dogs medical expenses. His surgery was a success and he is back on all fours enjoying life! We are happy to report Duke was adopted not long after his surgery! We would like to dedicate this years Theme Basket Auction in memory of Buddy, who passed away this week. Buddy came to us as an abandoned dog with special needs, he was born with a deformed front leg and walked around on 3 legs his whole life. We estimate his age to be 15 - 17yrs old. Although we only had Buddy a few month's at the shelter we all grew to love him very much and we know in our hearts we gave him a better life over the past few months. Buddy had good days and bad days as any senior pet experiences....even on a bad day he still enjoyed doing his job. You see, Buddy soon turned into a part of our staff and tried to reciprocate all the care we gave to him by taking care of the kittens. This year we had an extraordinary amount of kittens without mothers, and Buddy would try to help out and take care of the kittens. You could tell he thoroughly enjoyed his job...if he could smile he would! 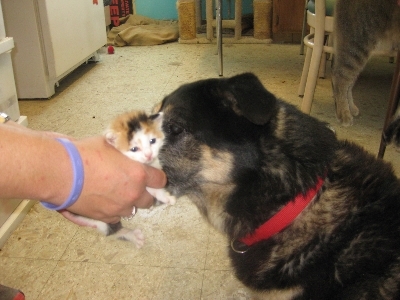 It was a sight to see this handi-capped old dog giving back to the numerous little kittens we had at the shelter...he was doing his part and making a difference in these kittens lives. 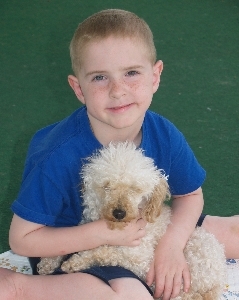 We will miss Buddy and this special needs dog will be remembered as a truly special boy who is forever in our hearts! I am so happy to donate this quilt to the SPCA Serving Allegany County. 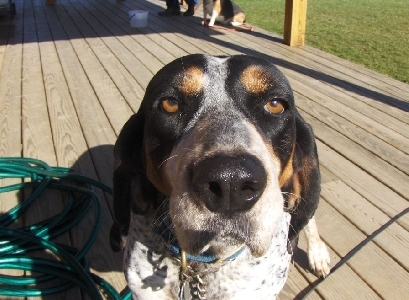 My husband and I adopted Twila, a Bluetick Coonhound, from the SPCA several years ago. 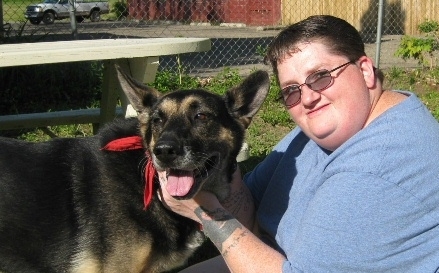 Twila's story is typical of the loving care that all dogs find at the shelter in Wellsville. Twi had been adopted once from the SPCA but was returned when her first adopter realized that Twila was gun-shy and would not hunt. She lingered in the shelter for another full year until we came along. In that time, Twila received such excellent care. Her volunteers walked her, talked to her, and petted her daily. When we adopted her, she was so well socialized that she fit into our two-person, two-dog family instantly. Our nickname for her is "The Diva" because of her particular way of demanding a Milkbone. We can say with confidence that The Diva is pleased with her new home, and we love her immeasurably. She is, as we like to say, "speckle-tacular." It may seem odd to link a Bluetick hound with an intricately patterned quilt, but there is a connection. I bid on this quilt at an Amish relief auction in Addison, NY, in the spring of 2011. It was stitched in Transit Bridge, NY, especially for this event which was run entirely by the Amish. I had no intention of bidding on a quilt that day, but when this one came up, it was so breathtaking that I couldn't help but bid. I set a mental limit on the dollar amount. Evidently, it was the same limit that the back bidder set, too. The bidding was intense, and I got caught up in the excitement. I found out later that the guys helping the auctioneer work the crowd are called "sweet talkers." Yes, they definitely sweet talked me! I arrived home with a beautiful, hand-made quilt that I just cannot use. I realized that a quilt of such beauty and value deserved a space that I couldn't provide. I could sell it on eBay or Craig's List, but I want the quilt to go to a home where it is loved and appreciated -- just as Twila is loved and appreciated. If you are lucky enough to get this quilt for the price of a raffle ticket, you are getting an invaluable bargain. We hope that you will "pay it forward" by donating to the SPCA Serving Allegany County and that the quilt will become a treasured family heirloom. 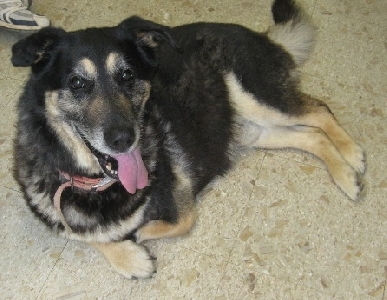 Thank you for supporting Twila and the many dogs like her.